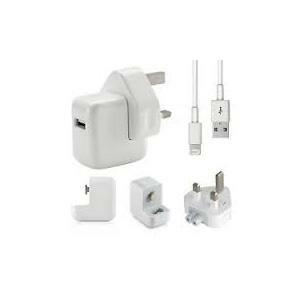 This is a brand new genuine Apple USB adapter to charge your iPhone, iPad or iPod at home, on the road or whenever it's not connected to a computer. 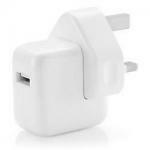 Why risk your expensive and much loved Apple device with a cheap inferior charger that could risk damaging your pride and joy when you could buy the genuine brand new item from us for less? 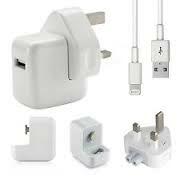 I have an Apple iPad 4th Generation Model A1460 MD5268/A and require a mains charger with cable. Which is the correct one please. Hi this is the correct charger. Hi yes this is the correct genuine charger. I just want to know if the above charger is for iPad mini. I have left my mini iPad 3 pin charger and lightning lead abroad. Will this replace them ? Hi yes this is the correct charger. Hi, I have a north American ipad air that came with a non apple 2 pin to uk plug converter - I would like to get a genuine adaptor to charge - is this what I need? No its a charger you can do that for free using WIFI. Hi,I was looking for the 12w mains charger but possibly with a extra long data cable, is it possible to get that together rather than having to buy the extra long cable seperately? Hi sorry we only have them as they are shown on the web site. Hi I'm after a charger cable for my I-pad 4 retina display, but need a 2 metre long cable, I see by one of the questions you do them but can you tell me the price and have you one in stock? Thank you. Is this product compatible with the iPad Air? Hi if that is a iPad that takes the smaller Lighting type 1cm connector then yes it is. Is it genuine apple charger? Will it work with iPad 3 ? 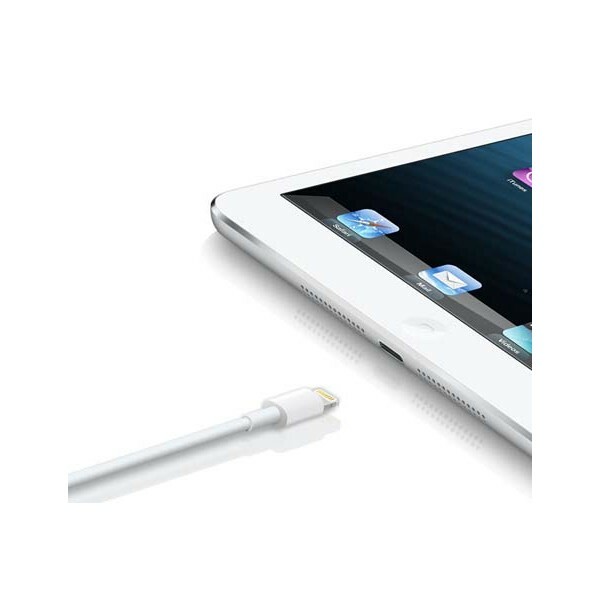 will this also work on the ipad 2 if I change the usb lead? 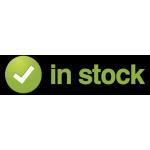 Hi just order one for this site and we will send one straight out to you in the post. Hi yes it will do it has the latest chip/software in it. Hi yes this will work with that iPad and it is a genuine charger. hi I have iPad mini with retina display the newest one is this the right charger as I need a spare. Hi i bought my i pad in America it is a MD510LL/A i pad 16GB Wi-Fi. is this the right charger for this i Pad? Hi if that is the iPad 4 you have then yes that is the correct one. Hi yes this is the correct one for the Air. Hi it is for the iPad 4 and iPad mini. I bought a iPad in the US and received the Mains Charger with a US plug part - is it possible to purchase the UK plug part that would slide on without needing to purchase the whole unit? Hi sorry we only have the whole units but we do have some USA to UK plug convectors that have just come in. Call us on 01564-777231 and we can supply you one. Hi the standard 1 meter but we do sell a longer 2 meter cable as well. Can i use this charger on my iPhone 5 ? Hi yes it will work fine with the iPhone 5 as well. Hi is the charger port 1 inch wide or 1 cm wide ? Hi yes it is the correct charger for that iPad. Hi yes this is the correct UK charger for the iPad 4.